It’s about time I told you about some Indonesian grub. There has been no shortage of odd and notable food in my life since I arrived, but today I thought I’d focus on one particular thing that’s cropped in a few different places: Cheese. Then again, you do run into cheese in some unusual places. 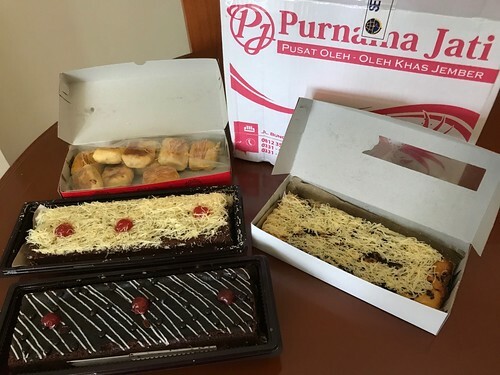 Back on Carefree Day in Jember our local hosts presented me and my colleagues with large boxes of packaged local cakes to bring back to Jakarta with us. This was a lovely gesture, expect that the airline forced us to check our cake boxes (???) so we ended up having to hang around at the luggage carousel even though we’d cleverly travelled with only carry-on bags. Apparently this cake could not travel safely in the cabin. Naturally, I was curious to check out the contents of the sealed boxes once I got home to Jakarta. And here it is - what a spread! First - DO NOT BE FOOLED. Those look like regular cakes right? And that bottom one totally looks like a tray of brownies. Which it is… sort of. All of these treats are made from tape (pronounced TAH-pay, and note that link requires translation). Tape is a fermented product, sometimes made from rice, but here we were dealing with the cassava variety. (Cassava is a starchy root vegetable called manioc or yuca in other parts of the world.) I’ll admit I was having a bit of trouble getting to the bottom of this tape business, mostly because all the websites are in Bahasa and Google Translate can only do so much. "Prol Tape is known as food with nano-nano flavor, in it can contain sweet, sour and savory taste. 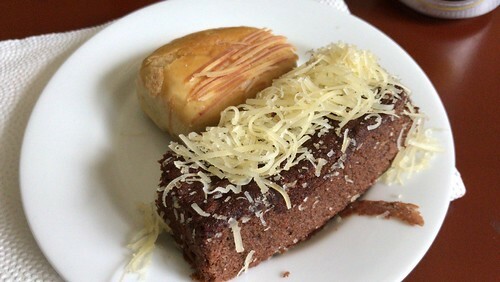 This cassava-based food offers a variety of flavors ranging from chocolate, cheese, raisins and original. Types of food made from wheat flour, cassava tape, milk, butter and eggs it tastes almost like a cake but the flavor of tapenya is very tasty that is sweet, wry and tasty." So you can understand why I was confused until I found this You Tube video - which you all really need to watch right now - where the making of cassava tape is detailed in still photos and videos with English subtitles and a backing track of “I will survive”. (It is the video that proves you can find anything on YouTube). For those without the inclination or bandwidth, here are the basics: peeled cassava is partially cooked then sprinkled with a powdered form of yeast, wrapped in banana leaves, and left to ferment for about three days. The end result is a soft, sweet but a little bit sour and slightly alcoholic mushy thing. I can only assume that’s what forms a large part of the cakes from my box of cake. So there I was with a box full of cake made from fermented cassava. Luckily, I didn’t really understand the whole fermented cassava thing when I first tried the cake and therefore approached it with an open mind. It was a bit heavy and quite moist but otherwise, pretty nice and reasonably cake-like. 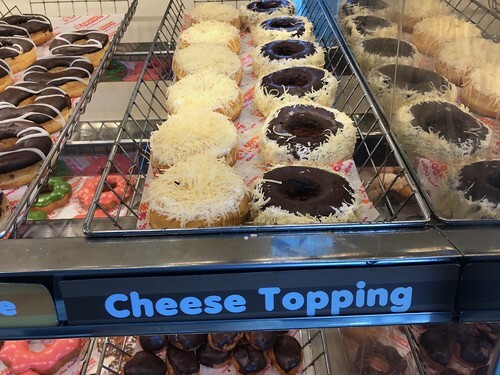 The thing that really threw me off was the topping. See the stuff on top of the brownie that looks like grated cheese? It looks that way because it is, in fact, grated cheese. Or here, at Dunkin Donuts. (Yes, they have Dunkin Donuts here. Also Krispy Kreme and A&W, though it’s not A&W as we know it.) Honestly, Indonesia, WTF? A chocolate glazed donut rolled in grated cheese? Ok, we’re talking about a relatively mild cheddar here, but still it’s just not right. I blame the Dutch, who brought their cheese culture here as colonial overlords but clearly did not take the time to explain the finer points before they left. Finally, there was the delicacy we sampled on the Jember trip on our first day there. After we’d concluded the business of the day we had some time to do a bit of sightseeing and ended up driving half-way up the mountain outside of town to a faded old resort hotel. Along the way there were some nice views. And once we got there we had a good look down at where we’d come from. And of course we stopped to sample the local delicacy as recommended on the TripAdvisor page that directed us up the mountain. One review in particular pointed out that the “banana fritter come up beyond expectation” so of course we had to try that. Pisang keju. Literally, “banana cheese”. This has confused-Dutch-mashup written all over it - especially the chocolate sprinkles part. 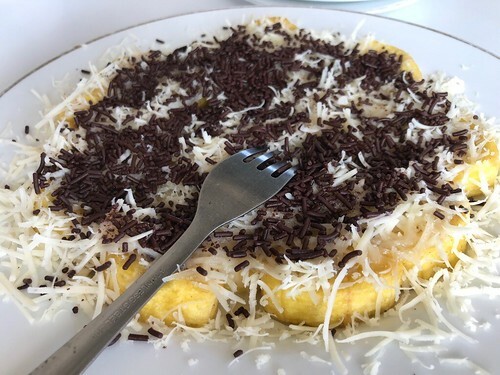 Sliced bananas, lightly coated in flour and pan-fried, topped with grated cheese and chocolate sprinkles. I think there may have been sweetened condensed milk in there too. It was weirdly ok, but maybe that’s just because I was hungry. Also these bananas are a different variety that the usual Cavendish that we get at home. They were starchier and less sweet and I think that helps. Our lovely local staffer said this is a very common preparation in Indonesia, and one that she even makes at home. However, I can’t help but think it would be greatly improved by removing the cheese, and I say that as a committed caesophile. But think about it: fried bananas + condensed milk + chocolate = undeniable yumminess. Whereas: fried bananas + condensed milk + chocolate + grated cheddar cheese = Huh? We didn’t finish the whole plate of pisang keju. Too much keju for my taste, and it was also quite filling. Since that trip I’ve seen this weird grated-cheese-on-dessert phenomenon repeated over and over again. I think my "I'll try just about any weird food" credentials are pretty unimpeachable, but I struggle with this. Cheese - at least the firm, salty cheese we're talking about here - is such a very savoury thing. If we were dealing with cream cheese or ricotta or mascarpone or similar then I'd be all over that. But I find this combination a bit like dipping your pain au chocolate in soy sauce or spreading your chocolate cupcake with a nice layer of miso paste. Yes, you could get used to it, but why bother? In the mean time, work is still busy. 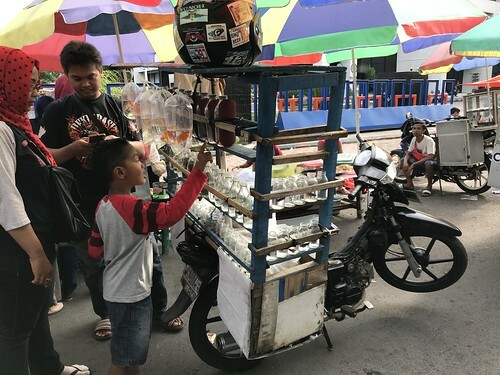 I've tried to do some touristy stuff in Jakarta, but have been slightly defeated because it's a very big, very hot, very choked up city so it's hard to move around, and then mostly uncomfortable when you get where you're going. Or perhaps I just had a bad day. Stay tuned and I'll try to find something worth telling you about. And while you're waiting could someone please have a Tim Hortons Sour Cream Glazed donut in my honour? With extra gorgonzola, please. *P.S. Am I the only one who thinks “Inappropriate Cheese” would be a great name for a band? Working internationally is challenging. You have to accept that everything that might be simple and straightforward at home will inevitably be complicated and opaque in your new environment. You’re working in an unfamiliar culture, with people who often don’t speak your language. Frequently they are people who’ve never before done anything like what you’re asking them to do. Finding the tools and materials you need can be difficult or impossible. And there’s a new currency, a new climate and new food. I’ve always said that there’s a constant low level of stress that goes with living and working in a foreign place - you may perceive it or not, but it does wear you down. Sometimes. And sometimes you have to spend your Easter Long Weekend flying out to visit a couple of potential suppliers. On the tropical island paradise of Bali. So yeah, I had to work over the long weekend. But that work was on BALI, probably Indonesia’s best known and most popular tourist destination. That’s how I found myself, accompanied by my designer colleague Nathan, at a lovely guesthouse run by our local contact in Ubud. 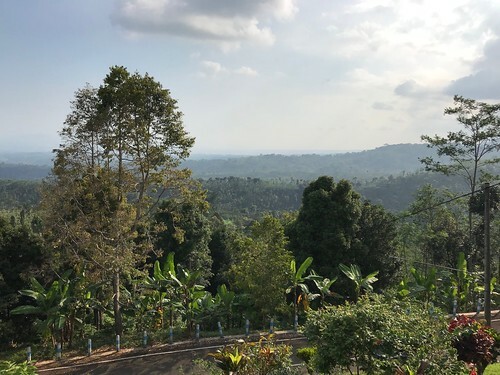 Ubud is a small town sort of in the centre of Bali, well away from the better-known surfer-focused coastline town of Kuta. 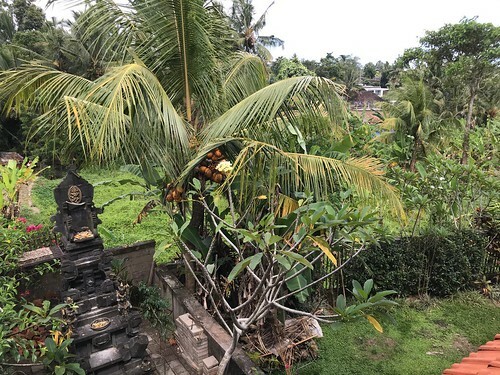 Ubud has a history as an artistic centre and more recently has attracted the yoga and spa culture. 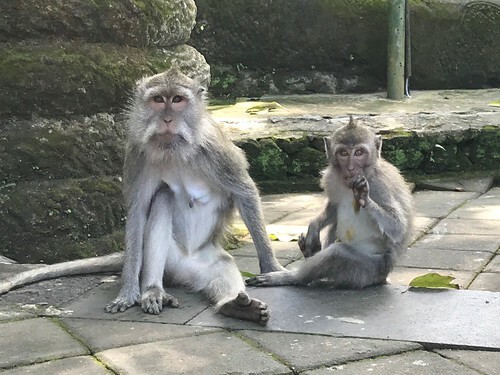 And while we may have escaped the drink-fuelled Aussie vacationer crush of Kuta, there’s no escaping the fact that Ubud is still a tourist town. So I was pleased that our guesthouse was a pleasant walk from the main drag, literally set among rice paddies. 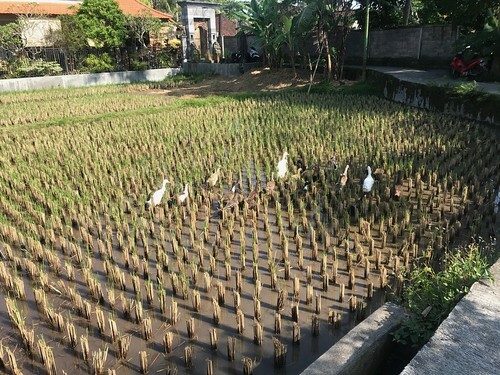 Plus there was a herd of ducks who lived in the rice paddy. I say it was a pleasant, except that it was even hotter than Jakarta. Like hot enough that Nathan was heard to say, “The sun is trying to kill us.” I’m starting to acclimate to the temperature here, but it was still tough and I basically had to resign myself to being a damp and sweaty mess for most of the three days we were in Ubud, while also having about 3 quick showers a day. Sort of like the adult equivalent of running through the sprinkler. 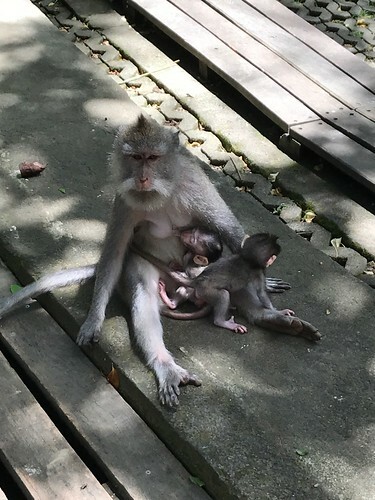 However, there was one place in Ubud where the sun’s anger was mitigated: the Sacred Monkey Forest Sanctuary, a popular tourist spot at the southern end of the main north/south street in Ubud, appropriately called Monkey Forest Road. Take care indeed, as we shall see. A particularly dense collection of offerings. 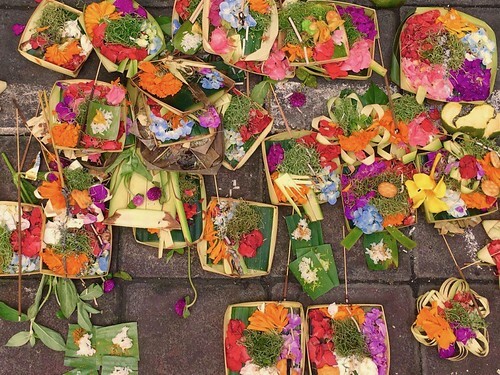 I very often saw people - both men and women - walking with woven palm trays full of these little offerings, stopping to place them at different locations. 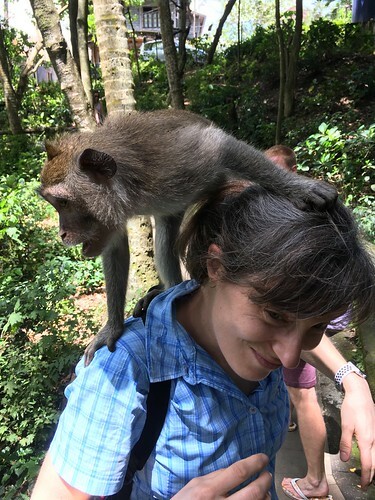 DO NOT PANIC if the monkeys jump on you, please drop any food and walk away. They will soon jump off. 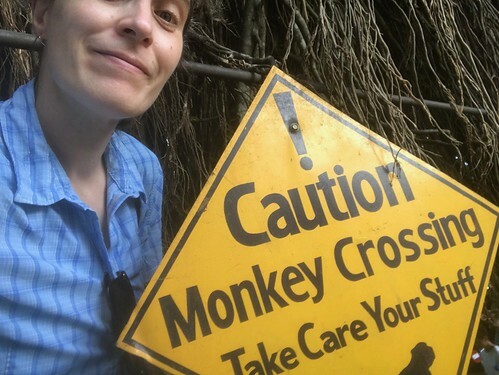 DO NOT RUN, when monkeys approach you, keep calm and don’t scream. Avoid shouting as this may frighten them. DO NOT LOOK MONKEYS IN THE EYE, this is interpreted as a sign of aggression. DO NOT HIDE AND FOOD, because the monkeys will know and try to find it and do not ever try to pull it back. Even before you enter the forest you notice the monkeys, who, being wild animals, wander where they want and often end up out in the road near the entrances to the park. As soon as you get into the park you realise just how many monkeys there are, and just how habituated they are to humans. Here’s one near the entrance, plundering some offerings for food. This is also a frequent tactic of the local chickens. And so we started walking through the park, enjoying the cooler air and taking eleven zillion photos, as did everyone else there. 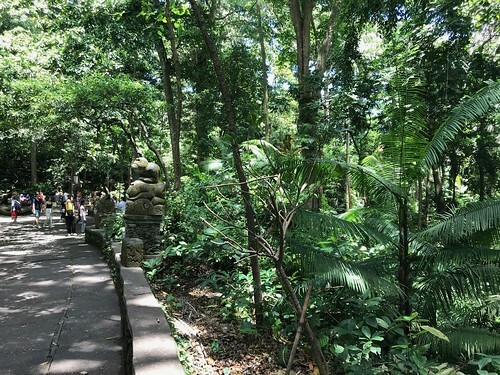 The foliage is dense, and the park has several wide paved paths. Also monkeys. Lots and lots of monkeys. Including stuff with twin baby monkeys! The park staff feed the monkeys a steady diet of sweet potatoes and you’re discouraged from feeding them anything else. But its clear the monkeys are completely adapted to life as a tourist attraction. 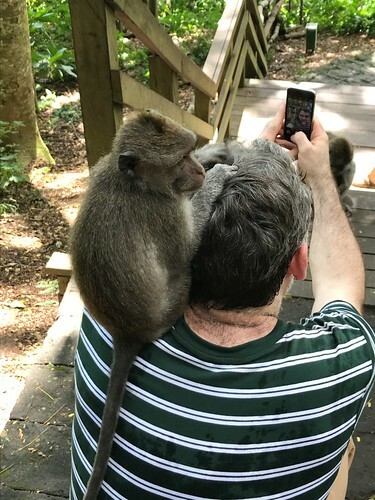 Early in our visit Nathan sat on a stone wall lining one of the paths and a large monkey crawled right over him as he sat taking a photo of another beast. 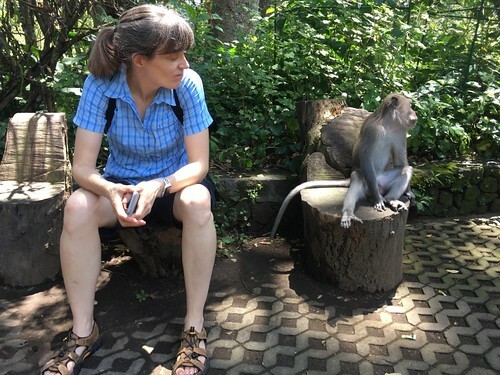 He had the presence of mind to keep still and just let it happen, but that wasn’t the only up close and personal encounter we had with monkeys that day. But Nathan did get a good going over from this one and still managed to get a selfie in the process. As we were making our way around the park, the monkeys seemed to get a bit bolder. Or perhaps there were just more of them around. One decided I and my bright red daypack were of particular interest, jumped right onto my shoulders and proceeded to open the zipper of the pack and extract both my bottle of water and my sunglasses before I got the pack off and he departed. Luckily, my sunglasses were deemed inedible so I got those back. The water bottle ended up as a donation to the monkeys. Here’s the larcenous litter bugger caught in the act. 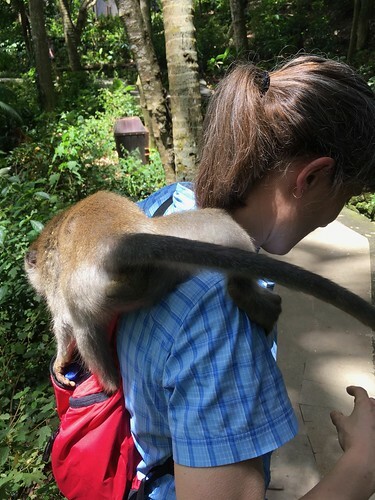 And I know it’s hard, but can we please refrain from the inevitable “monkey on my back” comments? Nathan later reported that he wasn’t really sure what to do to help. And though he did do an excellent job of capturing the whole event on camera, he admitted that by this point that it was clear “the monkey was in charge”. 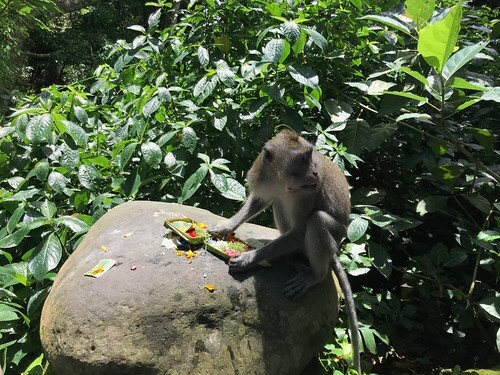 By the time we'd extricated ourselves and any remaining possession from the Monkey Forest it was well past lunch time and we were both very much in need of food and drink served in cool monkey-free surroundings. Luckily we found all of that a short walk down Monkey Forest Road were they served us very very cold very very tasty beer and french fries sprinkled with an addictive house-made mix of salt, chili powder and palm sugar. Sounds a bit weird but tastes amazing. (As Nathan pointed out, it was the holy trinity: salt, fat and sugar!) Then we really had no choice but to wander back to the guesthouse with the promise of cold showers and naps beckoning. As we walked through the rice paddies, we started to hear a lovely chiming tune and gradually realised it was coming from our place. Our host is a musician and composer (the guesthouse is an intermittent sideline) and it became apparent that there was some kind of group rehearsal going on in his private rooms one floor down from the guest rooms. This was made a even more magical and mysterious by the fact that we couldn't see any of the musicians, we could only hear the sounds filtering up from below. So after a quick rinse in the shower I lay on the cool sheets and closed my eyes and listened to ethereal music and it all blended into a sort of dream. 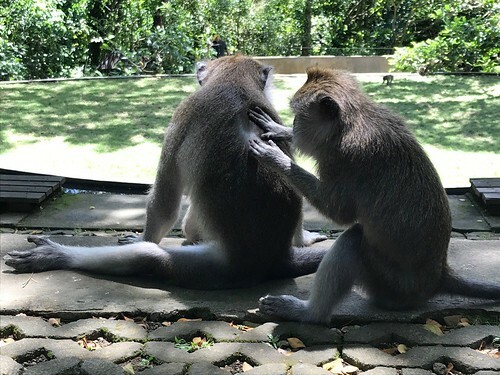 We were only on Bali for about three days, but it was long enough to know that a return trip would not be a bad idea at all. The direct flight only takes a couple hours and costs about £100, and the guesthouse was friendly and there's still a lot more to see. Oh, and the supplier meetings went well, so I guess there's a chance I'll have to go back anyways. Work, work, work, eh? I know I live an unconventional life. Some days though, that point gets driven home with such force that I just need to share. Such was the case when I woke up on a Sunday morning in Jember. Jember is a small city in the eastern end of Java, and I was there with a couple of colleagues to visit a supplier for the ceremonies. 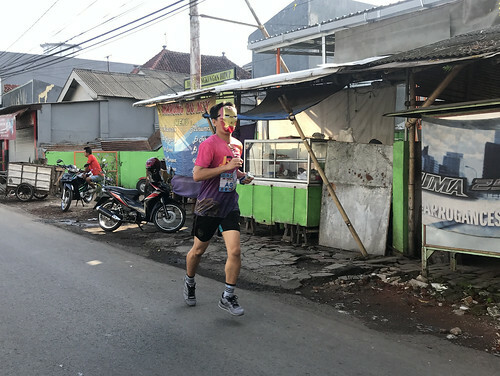 (Actual quote from the very very short Wikitravel entry on Jember: "Whilst not the most attractive or interesting of cities, it does have decent facilities for visitors…” A ringing endorsement if I’ve ever heard one.) We flew out very very early Friday, had activities and meetings on Friday and Saturday, and were scheduled to fly out again Sunday morning. Before we finished our meetings, the local supplier suggested we come out Sunday morning to see a rehearsal he was conducting for an annual event that happens every year in Jember (unrelated to the ceremonies). By this time though, we were tired and protested that we had an early flight and there probably wasn’t time to drop by. That’s when he told us the proceedings started at 7am, so we really had no choice but to check it out. It would have been rude not to. 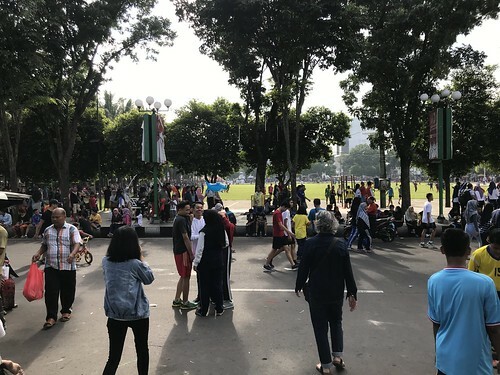 I fully expected we’d show up to the downtown park in Jember shortly after 7am and find a small, disconsolate group of people, resentful of the early hour, and maybe a couple of dog walkers. After all it was 7am on a Sunday. Who would be out at that hour? 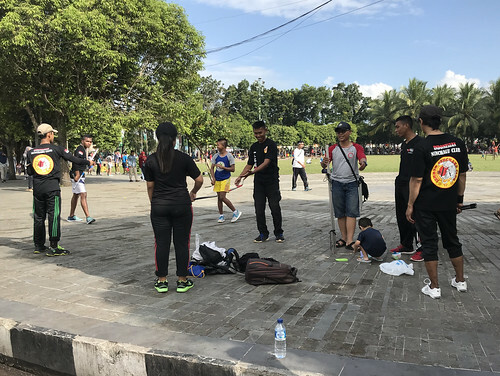 Our first clue that we were seriously underestimating the people of Jember came in the car en route to the park when we realised there was some kind of Fun Run going on. The opposite lane of traffic was mostly full of people wearing bib numbers and clearly involved in an organised race. Naturally there was no traffic control, though people seemed unconcerned with that. And oddly, there was some kind of superhero theme to the race. We saw lots of Batman t-shirts, a few Wonder Womans (Wonder Women?) and at least one fully costumed Captain America. And that is definitely an Ironman mask. Well played, sir. When we finally reached the Central Park we were frankly stunned. Central Park in downtown Jember was bustling. Time: 7:20am Sunday. Sunday morning is apparently a big deal in Jember. The young local staff person who was accompanying us on the business trip called it “Carefree Day”, which I think is delightful*. She insisted that this was normal for a Sunday. I suppose in a place where the weather is as wiltingly steamy as it is here it makes sense to get out and do things before the worst heat of the day sets in. And when the call to prayer comes at sunrise, maybe you’re up anyway so why not head into town and have some fun? And what fun it was. Beside the Superhero Run, the perimeter of the park was filled with people. There were lots of stalls and carts selling food - mostly rice, or noodles, or rice and noodles, along with many other unidentified things, many of them fried. It was a lot like the breakfast buffet at the hotel in Jember, which I’d had high hopes for. I love a good hotel breakfast buffet, and this one was extensive. Unfortunately, despite it covering one whole wall of the large dining room, there was almost nothing I could identify, unless I wanted to have rice and noodles for breakfast. The only chafing dish that contained western style breakfast items had baked beans (made from kidney beans) and something called “Spaghetti Mushroom" (actually rotini with some kind of dark brown sauce). There was also toast, and fruit and a few semi-recognisable pastries. I had fruit. Yes, I know part of the point of these jobs is to be adventurous and learn to appreciate the local culture and blah blah blah. And I promise there is a lot of weird food to come on the blog. I’m truly already overflowing with weird food experiences. And I understand bacon would be a stretch in an Islamic country. But on a Sunday morning at a nice hotel I want a damned croissant and some eggs. Not a steaming bowl of rice porridge topped with tiny dried fish. But back to Central Park Jember. There weren’t just food stalls. There were also a lot of people engaged in some kind of sporting activity. A few were running through the crowds around the perimeter of the park, and some of them were wearing those plastic jackets you put on to make you sweat more. (Seriously? This is really not a climate in which you need assistance to get a sweat on.) There was also a large group doing karate, some impromptu volleyball and badminton, and a lot of kick-about football. And of course the local chapter of the Indonesian Nunchuk Club. For the kids there were a lot of people selling balloons and kites and model planes and bubble wands and other toys. There were also sandboxes to play in, and ones with tubs of that weird kinetic sand stuff. And no street fair is complete without a bouncy castle. Let me just say this again: 7am Sunday morning. My favourite was definitely the guy who was selling tropical fish. He had goldfish in bags, along with a whole metal-framed rack of tiny bottles, each with a single fighting fish in it. And all of this was mounted on the back of his motorcycle. Of course. Forty glass jars filled with live fish on a motorcycle. It was a Dr. Seuss illustration come to life. But back once again to Jember Central Park. If you’re not interested in buying a fighting fish from the the back of motorcycle, don’t worry. 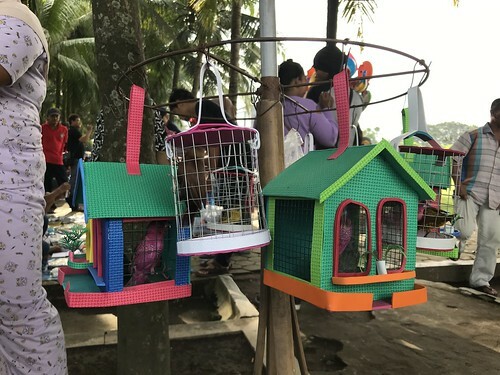 You could also get a colourful little bird in whimsical cage. Or a small brightly painted crab. These are not painted seashells. 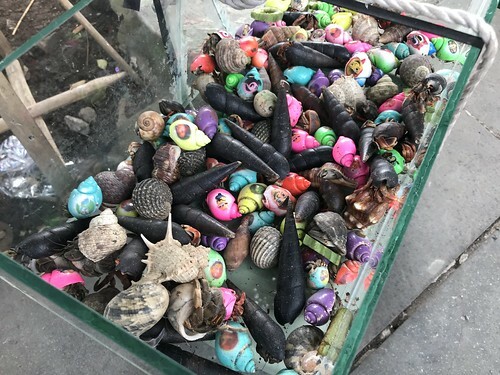 These are live crabs in shells, for sale. My Aussie colleague recalls her kids buying these on family holidays in Indonesian (which I guess is the equivalent of the Mexican vacation for North American families). Apparently a useful side effect the bright colouring is that it makes the crabs easier to spot when they escape and are running/scuttling free in the house. 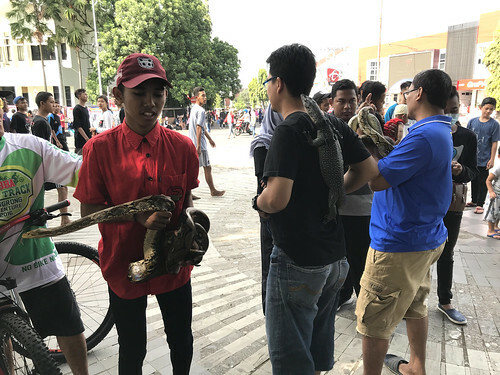 Completing the menagerie was what I can only assume was the weekly gathering of the Jember and District Reptile Fancier’s Club - a group of young men gathered at a corner of the park holding various snakes and assorted scaly things. I also love that this guy is essentially wearing a lizard as a backpack. Because how else do you transport a lizard? Finally, rounding out the facilities on offer at the park was a large display in honour of World Oral Health Day, manned by the students of Jember University School of Dentistry. So let’s review, shall we? By doing a single circuit of a small park at 7:30am on a Sunday I could have purchased virtually unlimited amounts of food, drink, clothing and/or live animals, played a game of football or badminton, done a bit of karate or nunchukking, petted a giant lizard, and had a quick dental check up. All this while losing about 20% of my bodyweight in sweat. Still, you have to hand it to those Jembervians (Jemberites? Jembergs? ), they really know how to rock a Sunday morning. Apparently there are similar gatherings in central Jakarta, starting at around 6am. I may check that out one week. Especially if I can then proceed to the air-conditioned splendour of the Hyatt Hotel weekend brunch buffet where I am promised a proper slap-up breakfast with the added bonus of free-flowing booze to go with my bacon and eggs. It may not be in the local spirit, but sometimes you just need a different kind of spirit, right? 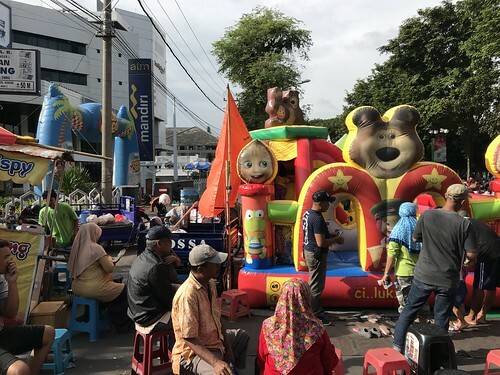 * Since that Sunday in Jember I've realised that I think my local colleague was not saying "Carefree Day" but, in fact, "Car-free Day", because the surrounding roads were closed to vehicle traffic. But that's not nearly so fun so I'm going to continue to think of it as Carefree Day. Don't try and stop me.